A year ago we assembled a full set of Sage X 7-weight Spey Rods just for fun, and education. And what we've learned is: Sage X rods and the KONNETIC HD graphite used in them are so revolutionary that one year later we are still discovering things about them that our competition hasn't even figured out how to look for. These rods are incredibly easy to cast (if you don't make it difficult). After 35+ years and ten generations of graphite innovation, it is no wonder Sage is the most copied brand of fly rods on the planet. Every other fly rod company wishes it were Sage. Sage and The Fly Fishing Shop in Welches, Oregon started business at nearly the same time. We grew up together, with the same philosophy: "Know the most, be the best." There is a lot of power in the word/letter/number X: X Men, X factor, X-files, and eXceptional. In this case, X the Roman numeral means ten, or in the case of the Sage X Series, it means tenth generation (of graphite development). The latest buzz word in graphite technology is KONNETIC HD, which is this era's cutting-edge performance graphite for building rods. By optimizing the graphite-to-resin ratio, Sage has created a higher density (HD) fiber composite, resulting in lighter, stronger blanks, which deliver unmatched recovery. In other words, magic! Everyone wishes they had more magic when fishing for winter steelhead. So we set up a plan to surround ourselves with it. In the X-Series, Sage builds a complete set of 7-weight, two-hand fly rods in 11-foot, 12-foot, 13-foot, and 14-foot lengths, and we have a complete set to fish with. Having a full assortment of the highest quality tools gives any team a huge performance advantage. Last year when we tested the full set of X rods, the river was high (up in the willows), but perfect color, and it snowed for even more fun. Frank Day picked the 7110-4, which was combined with a 7+ Hatch Finnatic reel and RIO 550-grain Skagit Max Short line. He walked downstream and fished the edge water. He knows that when the water is high, steelhead often migrate right along the edge of the partly submerged willows. Mike chose the 7130-4 with the 510-grain Airflo F.I.S.T. line to probe deep and wide in the main channel. I chose the 7140-4, which was combined with my Loop Classic 811 reel to given the rod the perfect balance with a 550-grain RIO Skagit Max. This outfit proved to be smooth and easy, but the water was too high in this particular run to maintain our interest so we moved on. By this time it was snowing hard. The water level in the next run was at perfect level to hold steelhead and we spent quite a bit of time there. All testing (fishing) was conducted with the idea of selecting the perfect tackle for a particular casting distance. Short rods are easier when casting distances are moderate, but very handy when room around the angler is constricted. Longer casts are easier to achieve with longer rods, but require more room. Larger flies are easier to cast with heavier Skagit heads and sinking tips, but lighter weight heads often produce higher line speed with the same rod. Higher line speed always equates to longer, more accurate casts, but only if you have enough kinetic energy to deliver the payload. So fly size, casting distance and the amount of room around you are always like pieces on a chess board to be moved around for maximum advantage. 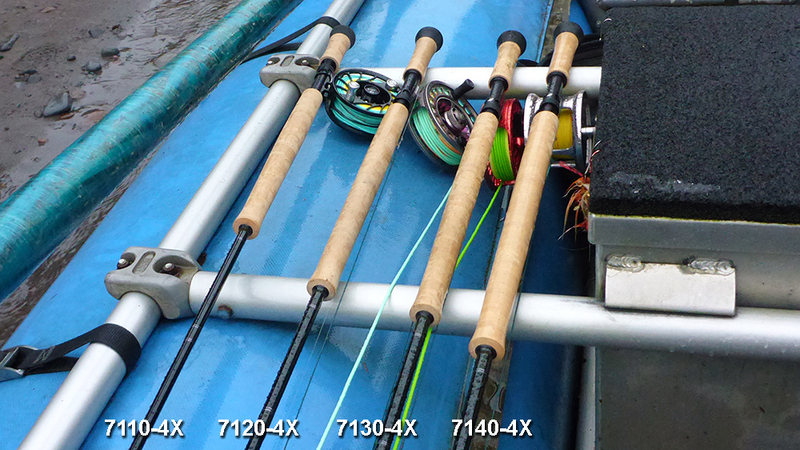 All lengths of these rods will deliver similar sizes of sinking tips and flies, but the longest rod will deliver it further. No surprise either that the longest rod will also hold more line off the water. The 7140 throws more line and controls line at longer distances. But, this rod also has a larger sail surface when the wind is blowing. For covering large water, the 7130 has enough length to fish at all distances and is a little easier on my body by being a little less fatiguing. Overall, Sage X series are some of the least fatiguing rods I have ever fished with. We traded rods around all day. Sage X rods produce a smooth flow of power through the entire cast with no shock waves or bumps in the fly line. Since humps and bumps in the fly line are always signs of speed robbing slack, the lack of it is a clue to why these rods are able to generate so much line-speed with so little effort. The largest problem many casters have in adapting to the X series is turning down both the length and aggressiveness of the stroke. Easy gets you more speed. Smooth gets you even more speed. The rods listed below were tested with more lines than are shown, but are listed in order of our preference for ease of casting, except for 7130 and 7140, where both Airflo and RIO lines were equal. Several days of fishing were involved with each rod to reach our conclusions, but it must be understood that in some cases more days of testing might lead to other conclusions. However, the lines listed below will suit most anglers, and are proven under actual fishing conditions (and in some cases with fish landed). As you can see, line weights don't stay totally consistent through all of the length/models, but they are pretty close. The precision in design standards is commendable. Sage X Rods - Buy them now!